Sometimes all you need are the right words spoken at the right time. The Wisdom Block of the Month includes thoughtful and inspirational quotes to live by. The fabric is from Windham Fabric's Wisdom collection designed by Nancy Gere. The pattern is by Common Threads. The program began in September 2018 and ends in August 2019. The finished quilt measures 86" x 98". 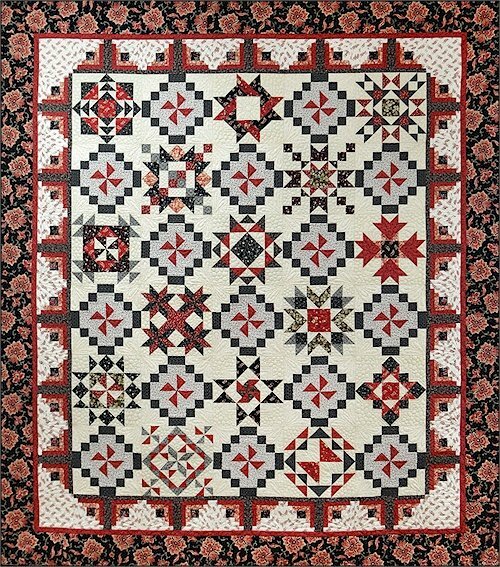 Included in the monthly BOM fees is the pattern and 19-1/2 total yards of fabric for the quilt top and binding. Kits will be available for pick-up by the end of the first full week of each month. Kits can be mailed each month for the additional actual USPS postage fees. We are now taking reservations for the Wisdom BOM program; $ 24.99 reserves your spot and goes toward the last month's BOM fee. This program is non-cancellable. To reserve your spot for the Wisdom BOM, call the shop at (408) 735-9830 or add to your cart above. Kits are ready the first of each month. Kits can be mailed.